President Bush on Tuesday hailed the formation of an interim Iraqi government due to take power in a month's time, but warned that violence would continue as the date for handing over sovereignty approaches. The president addressed reporters in the Rose Garden after officials in Baghdad named the president and Cabinet who will take power on July 1. A dispute over the presidential post had delayed that announcement. "The naming of the interim government brings us one step closer to realizing the dreams of the Iraq people," Mr. Bush said. "The rise of a free and self-governing Iraq will deny terrorists a base of operation, discredit their ideology and give momentum to reformers around the region." Ghazi Mashal Ajil al-Yawer, the head of Iraq's Governing Council and a critic of the U.S.-led occupation, was named president, after the Americans' preferred candidate turned down the post. Later, the prime minister of the incoming government, Iyad Allawi, announced his 30-member Cabinet. As word of the appointments was announced, a car bomb blew up outside the offices of the Patriotic Union of Kurdistan, which is located just outside the green zone U.S. coalition headquarters in central Baghdad. It was not immediately clear if the blast was tied to Tuesday's government announcement. The Governing Council decided Tuesday to dissolve immediately rather than remain in office until the transfer of sovereignty to the new government, said council member Younadam Kana. The U.S.-led occupation authority will continue to run Iraq until June 30, an official said on condition of anonymity. The administration official said the new Cabinet would begin negotiations on the status of U.S.-led international forces in Iraq after June 30 "fairly soon." Al-Yawer's selection to the largely ceremonial position or of president broke a deadlock over the makeup of the new Iraqi government. Iraqi leaders said the Americans were trying to force them to accept the U.S.-backed candidate. 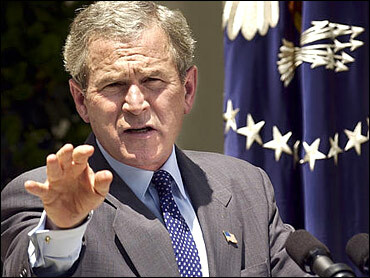 Mr. Bush told reporters that U.N. envoy Lakhdar Brahimi was "the quarterback" in selecting the new president. "I had no role in picking. Zero," Mr. Bush said. National security adviser Condoleezza Rice called the new Cabinet "a terrific list" and insisted, "These are not America's puppets." Mr. Bush on Tuesday was trying to line up support for a new U.N. resolution to recognize the new government and to establish conditions for its operation until elections are held. "We're going to pass full sovereignty," Mr. Bush said, but added that U.S. commanders would have the final say if troops needed to defend themselves. Some council members want the interim government to have more authority over the 135,000 American troops and other coalition forces on Iraqi soil. Some Iraqis are also seeking greater say. Allawi, a U.S.-backed Shiite Muslim with military and CIA connections, on Tuesday said Iraq needs help from U.S. and other multinational forces to help defeat "the enemies of Iraq." The U.S. will conduct military operations in consultation with Iraqi leaders, Mr. Bush said. The president said that a similar model had worked in Afghanistan, where he said the signs were "encouraging." If the Americans had insisted on Pachachi, they would have risked a major breach with their Iraqi allies at a sensitive period. Brahimi had hoped to complete the selection of the 26-member Cabinet by Monday, but the dispute over the presidency delayed the decision for a day. He acknowledged Tuesday that negotiations to establish the new government had been "very precise and difficult."